In a surprising development, veteran right-hander Jason Hammel has told the Rangers that he is retiring after 13 Major League seasons. Hammel had signed a minor league deal with the Rangers this winter, and was informed yesterday that he had made the team’s Opening Day roster. Rangers GM Jon Daniels told The Athletic’s Levi Weaver and other media that Hammel “was very apologetic about the timing” of his decision, coming so soon after the team decided to include him on its 25-man roster. With Hammel now out of the picture, Jeanmar Gomez (another minor league signing) will break camp with the team. Originally a 10th-round pick for the Rays in the 2002 draft, Hammel rose from that unheralded draft position to pitch 1810 1/3 Major League innings from 2006-18, starting 298 of his 377 career games. Never a big strikeout pitcher or a particularly hard thrower, Hammel relied on solid control and durability to become a rotation piece for six different teams over the course of his career. That skillset resulted in just shy of $60MM in career earnings for Hammel, including a pair of multi-year free agent deals with the Cubs and Royals. Hammel’s stint with the Cubs from 2014-16 was the productive stint of his career, as he posted a 3.59 ERA, 8.5 K/9, and a 3.62 K/9 rate over 446 innings (all of them in 78 starts) for Chicago. Unfortunately for Hammel, a late-season elbow injury kept him from participating in the Cubs’ historic playoff run in 2016, though his 166 2/3 frames of 3.83 ERA pitching in the regular season netted him a well-earned World Series ring. We at MLBTR congratulate Hammel on a fine career, and we wish him all the best as he embarks on his post-playing endeavors. Mariners reliever Hunter Strickland is “100% ready” for Wednesday’s Tokyo opener against the Athletics after being sidelined with back issues since March 3, per MLB.com’s Greg Johns. The high-strung Strickland, now 30, will apparently get first crack at the closer’s role for the new-look Mariners, who signed the righty to a one-year, $1.3MM deal after he was non-tendered by the Giants ahead of the November 30 deadline. After eight years in the minors, the then 25-year-old Strickland came out blowing smoke for the 2014 World Champion Giants, dominating early with a fastball that reached 100 mph on the regular. Multiple on-field dustups, including well-publicized boxing matches with both longtime nemesis Bryce Harper and a clubhouse wall, likely spelled the end for Strickland in San Francisco. After a 2015-17 stretch in which the 6’4 righty posted identical 0.8 fWAR totals with a K rate hovering around 8.5 per nine, Strickland endured his worst season in ’18, struggling to throw strikes, miss bats, and keep the ball in the park. His average fastball velocity, too, fell to a career-low 95.7 MPH, while heavier dependence on a changeup resulted only in withdrawal. Still, if the flamethrower can re-stoke his early-career heat, and direct much of it toward what seemed to be an ever-shriveling strike zone, the Mariners may yet have a massive bargain on their hands. It’s MLB or bust for the 36-year-old Jason Hammel, writes Evan Grant of the Dallas Morning News. Hammel’s been excellent so far this spring, striking out over a batter per inning while allowing just a single run in 8 2/3 IP, but says he has no interest in playing for the team’s chief affiliate: “I certainly won’t go to Triple-A,” Hammel said. “This is a grind. If it requires me to go home, I know my family is waiting for me and has been for a while. I’m more than willing to go home and spend time with them.” Per Grant, it appears the 13-year MLB vet will consider other franchises if it doesn’t work out with Texas, though he doesn’t necessarily seem set on a starting gig. He’ll compete for a long-reliever role in the Ranger pen with righty Adrian Sampson, and despite a career-worst ’18 in nearly every category, looks to have the inside track. The Rockies have predictably sent INF Brendan Rodgers back to minor league camp, tweets MLB.com’s Thomas Harding. A consensus top 30 prospect among all five major outlets (he checks in as high as #10 on MLB.com’s list), Rodgers had an outside shot to claim the team’s second base role in the upcoming season, but the team’ll look first to either Ryan McMahon or Garrett Hampson in the spot. The 22-year-old former third overall pick has impressed evaluators with his all-fields pop, though scouts seem less keen on his glovework at shortstop and discernment at the dish. In a late-season cameo with AAA-Albuquerque last season, Rodgers slashed just .232/.264/.290 with a 1.4% walk rate. Both ZiPS and Steamer, though, prefer him to any Rockie alternatives at the position, with the former projecting an impressive 98 wRC+/2.3 WAR line over a full season’s worth of plate appearances. The Rangers face an interesting long-relief challenge as they weigh how to handle Shelby Miller, Edinson Volquez, and Drew Smyly in their projected rotation, Jeff Wilson of the Fort Worth Star-Telegram writes. All three hurlers are in various stages of recovery from Tommy John surgeries — Miller has tossed just 38 MLB innings over the last two seasons, while Volquez didn’t pitch at all in 2018, while Smyly hasn’t thrown a Major League pitch since 2016. Zach McAllister and Jesse Chavez are two relievers with multi-inning experience, though Jason Hammel could also fit into a long man role if he doesn’t end up in the rotation himself. “I’m just here trying to make the team. I’m not expecting anything. I’m not opposed to any job,” Hammel said. After struggling in the Royals’ rotation for the last two seasons, Hammel was relegated to the bullpen last year, his first extended dose of relief work since 2008. Hammel is in the Rangers’ camp on a minor league deal. The Rangers announced Friday that they’ve signed veteran right-hander Jason Hammel to a minor league contract with an invitation to Major League Spring Training. Hammel is represented by ACES. Hammel wrapped up an ill-fated two-year, $16MM contract with the Royals this past season and will head to the Rangers in search of a rebound on the heels of two of his worst big league seasons. As a Royal, Hammel struggled to a 5.59 ERA in 307 1/3 innings, averaging 6.9 K/9 against 2.5 BB/9 with below-average ground-ball tendencies. Fielding-independent metrics felt he was marginally better (4.44 FIP, 4.95 xFIP), but the overall results were a far cry from the strong work turned in by Hammel from 2014-16 between the Cubs and the Athletics. 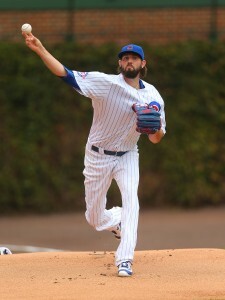 Over those three years, Hammel logged a 3.68 ERA with 474 strikeouts against 173 alks in 513 2/3 innings. The Royals announced that they’ve declined their half of right-hander Jason Hammel’s mutual option, thereby making him a free agent. Hammel will receive a $2MM buyout rather than a $12MM salary for the 2019 season and will hit the open market in search of a new club. The 36-year-old Hammel’s two-year pact with Kansas City proved to be a sizable misstep for the organization, as the veteran righty limped to a 5.29 ERA in 180 1/3 innings in 2017 before turning in a 6.09 ERA in 127 frames in 2018. Hammel lost his rotation spot in Kansas City this season and finished the year in long relief for a Royals club that finished last in the American League Central. Prior to his time in Kansas City, though, Hammel enjoyed a solid three-year run with the Athletics and Cubs. From 2014-16, he tallied 513 2/3 innings of 3.68 ERA ball, averaging 8.3 strikeouts and 2.4 walks per nine innings pitched. He saw his strikeout rate deteriorate with the Royals, though, and his ability to strand runners plummeted from roughly league-average territory to one of the worst in baseball with men on base. Those struggles seem likely to make it difficult for his camp to find a guaranteed role on a staff in 2019, but he’ll presumably still be viewed as a low-cost depth option by a number of teams. It remains unclear whether the Rays will move Chris Archer, but Jon Morosi of MLB.com writes that they and other teams have been “engaged in consistent trade talks” centering on the right-hander “in recent weeks.” Archer, a 29-year-old front-end starter who’s on one of baseball’s most appealing contracts (he’s controllable through 2021 for $34MM), has unsurprisingly drawn reported interest from a host of teams this offseason. Dealing Archer and his $6.25MM salary would help the Rays with their goal to cut payroll for 2018, but it would obviously make it all the more difficult for the team to compete in a division featuring Boston, New York and an active Toronto club. If the Royals re-sign free agent first baseman Eric Hosmer, they’ll give more serious consideration to trading left-hander Danny Duffy, closer Kelvin Herrera and right-hander Jason Hammel, according to Nick Cafardo of the Boston Globe. Bringing back Hosmer and keeping those players would ostensibly give the Royals a better chance to compete in 2018, though they’re reportedly in line to cut payroll and rebuild even if they do re-up him. Of Duffy, Herrera and Hammel, the former is the priciest – he’s owed $60MM through 2021, including $14MM this season – but also likely the player with the most trade value. Both Herrera and Hammel could become free agents in a year, depending in part on what happens with the latter’s $12MM mutual option for 2019. In the meantime, Herrera will earn $7.94MM this year, and Hammel will collect $9MM. The Twins still haven’t discussed a contract extension with Brian Dozier, and the star second baseman informed Rhett Bollinger of MLB.com that he’s “a little bit” surprised about that. The club is waiting on potential extensions until spring training draws closer, per Bollinger, though Dozier seems prepared to test the market in a year if Minnesota doesn’t make him a suitable offer by next winter. “I’ve had a lot of talks with a lot of guys about approaching free agency and how to handle it,” Dozier said. “I don’t want to get too caught up in it. But it is the writing on the wall and the elephant in the room.” Dozier, who will turn 31 in May, is slated to play the final season of a four-year, $20MM contract extension in 2018. That deal has been an absolute bargain for the Twins, who saw Dozier account for 14.2 fWAR/13.3 rWAR and bat .258/.335/.496 with 104 home runs over the first three years of the pact. Red Sox left-hander Brian Johnson has drawn trade interest this offseason, Cafardo reports. The hurler is out of minor league options, meaning the Red Sox could lose him to waivers if they don’t trade him and he doesn’t make their 25-man roster, Cafardo notes. Johnson, a first-round pick of the Red Sox in 2012 and a former top 100 prospect, has seen minimal big league action to this point (31 1/3 innings). The 27-year-old tossed 27 1/3 major league frames across five starts last season and did OK, notching a 4.33 ERA/4.90 FIP with 7.0 K/9 and 2.67 BB/9. Johnson fared better over 90 1/3 Triple-A innings (3.09 ERA/4.19 FIP, 6.97 K/9, 2.79 BB/9). That, according to Rosenthal, could even include controllable pieces like Whit Merrifield, who broke out with a .288/.324/.460 slash and an AL-leading 34 stolen bases last season. Rosenthal also notes that Kansas City would listen to offers on left-handed reliever Scott Alexander, who notched a 2.48 ERA with 7.7 K/9, 3.7 BB/9 and a ridiculous 73.8 percent ground-ball rate in 69 innings last year. Both players are controlled through the 2022 season and are still two years removed from arbitration eligibility. Beyond that pairing, the Royals have a few more obvious trade candidates. Kelvin Herrera and Joakim Soria are both quality right-handed relievers that are just one year from free agency, though neither is signed at a bargain rate. Herrera projects to earn $8.3MM in arbitration, while Soria is still owed $10MM through the end of his contract. Jason Hammel didn’t have a strong first season in Kansas City but ate up 180 innings with quality K/BB numbers and a 4.37 FIP. He’s still owed $11MM through 2o18. Left-hander Danny Duffy, signed for another four years and $60MM, would represent one of the top starting pitching options on the trade market if the Royals field offers on him. Interestingly, both Dodd and Rosenthal report that even as the Royals embark on a rebuild, they’re still in pursuit of a long-term deal with Hosmer. Per Dodd, team officials “see rebuilding scenarios that include” Hosmer in the fold. He’s still just 28 years of age, so Hosmer could indeed still be in his prime even at the conclusion of a two- or three-year rebuilding cycle, but it nonetheless seems counter-intuitive to sign him to what would almost certainly be a franchise-record contract while also dealing away big league talent. Furthermore, re-signing Hosmer would effectively cost the Royals a top pick, as they currently project to receive three compensatory selections after the first round of next year’s draft due to the losses of Hosmer, Moustakas and Cain (assuming each signs for at least a $50MM guarantee, which seems likely). Those picks would not only give the Royals five picks in the top 40 or so selections of the draft — Kansas City also has a pick in Competitive Balance Round A — they’d also significantly bolster the Royals’ league-allotted draft bonus pool. Each of those comp picks for the loss of Hosmer, Moustakas and Cain would add about $2MM (give or take $100K) to the Royals’ draft pool, based on last year’s slot values. Of course, it remains to be seen whether Hosmer even has interest in returning to a Royals team that could spend the first two or three years of that contract losing more than it wins. If Hosmer’s market fails to develop, it certainly stands to reason that a return to the only organization he’s ever known could be a nice safety net. But, it’ll likely be difficult to sell Hosmer on staying in Kansas City while simultaneously trading away his longtime teammates for younger, unproven commodities. If the Royals do deal away big league talent without acquiring much in the way of reinforcements for the 2018 roster, they’ll join the White Sox and Tigers as rebuilding clubs in the same division. That would seemingly give the Indians and Twins all the more motivation to act aggressively as they seek to bolster their clubs this winter, as few teams ever have the luxury of competing in a division where three of their four primary rivals are largely punting on the season at hand. The Cubs’ World Series victory triggered an escalator clause in manager Joe Maddon’s five-year, $25MM contract, reports Jon Heyman of FanRag Sports. Maddon’s annual salary will now be bumped from $5MM to $6MM in the final three years of the deal, though the skipper claims to ESPN Chicago’s Jesse Rogers that he wasn’t even aware of the clause. “I’ve never seen a paycheck,” Maddon tells Rogers. The Braves are in the market for a right-handed-hitting outfielder that can handle center field. Currently, Atlanta lacks a clear-cut fourth outfielder and is set to deploy two left-handed-hitting starters in Ender Inciarte and Nick Markakis. Rockies right-handers Jason Motte and Chad Qualls, each of whom disappointed in the first season of their respective two-year contracts last year, are both available in trade, per Heyman. Motte hasn’t enjoyed a strong season since 2012 and has undergone Tommy John in the interim (making the two-year deal all the more surprising). He’s owed $5MM in 2017. As for Qualls, the 38-year-old is more affordable at $3.25MM this season, but he’s also considerably older and coming off a worse year. Jason Hammel and the Mariners were discussing a one-year deal in the $10MM range before he switched agents this offseason. Following the change in representation, Hammel shifted course and took a larger guarantee but a lower annual value, inking a two-year deal worth $16MM with the Royals. Seattle, in turn, picked up Drew Smyly and Yovani Gallardo via the trade market. The Marlins’ offer to Kenley Jansen this winter was, perhaps unsurprisingly, extremely backloaded, Heyman reports. The deal would’ve paid Jansen something in the vicinity of $7MM in year one, $9MM in year two, $11MM in year three and $25MM in each of the final two years. That’d obviously be an advantageous structure for owner Jeffrey Loria, who is looking to sell the team. The Padres and Tigers are both still looking to add to their roster, with San Diego focusing on shortstop options while Detroit pokes around the market for center field help. Heyman notes that the Friars would prefer a shortstop who is controlled beyond the 2017 season. Currently, the only MLB-ready, in-house option that fits that bill is Luis Sardinas. The Twins were willing to pay Mike Napoli $11MM on a one-year deal or $16MM on a two-year pact, but Napoli instead is headed back to the Rangers on a one-year, $8.5MM deal with an option for the 2017 season that would allow him to match the $16MM total he could’ve made over two years in Minnesota. The slugger tells Heyman that he’s already made a lot of money in his career and instead prioritized winning. The Rangers are still hoping to talk extension with Jonathan Lucroy and Yu Darvish. Lucroy tells Heyman that he “would absolutely love to stay” in Texas, adding that he likes the culture, the coaches and his teammates. The former Brewers backstop conceded that he at one point regretted signing his initial contract — a five-year deal with a club option that will end up paying him a total of $15.5MM over the six years — though it sounds like those days are behind him. (And, obviously, he’s poised to do quite well for himself in the very near future.) As for Darvish, Heyman notes that his agents may well try to use Stephen Strasburg’s seven-year, $175MM contract as a comp in negotiations, but the Rangers aren’t willing to push it that far to retain Darvish.